* Snap photos of your gadgets and small gifts anytime and anywhere! * 20pcs bright lED beads provide with uniform light. * Provid white and black backdrop make this shooting tent meets different shooting requirements. * Portable design,easy to store and carry, suits for shooting high quality picture for small products at anyhwere and anytime. * LED light powered via a USB cable. * As the lighting source quantity and variaty were limited due to its size and portability. We recommend you. to used as a temporary studio for its excellent easy-to-use feature and portability. Folding product size:9.8" x 9" x 0.39"
Please noted# you need to connect the USB cable to your own power bank, computor or AC charger to get power. MINI PHOTO LIGHT BOX: This Photography Studio Great for Photographing You Small Gift and Small Item, For example: small Christmas gifts, small food, small pets, jewelry, ornaments, etc. THE LATEST BUTTON DESIGN: This Photo light box more stable than traditional magnets,let your studio avoid collapsing.Easy to Carry: Adopts the latest press stud design, collapsible design, Space-saving and resist compression. 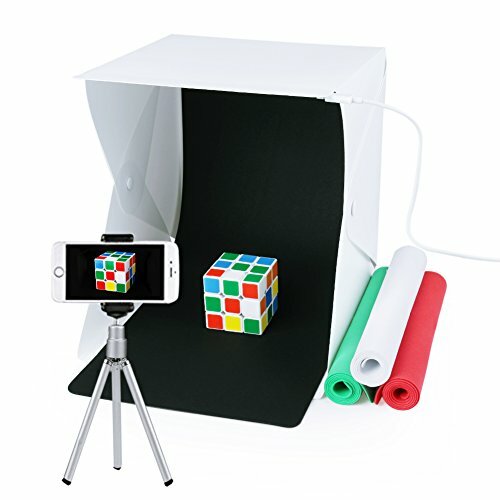 4 BACKGROUND：This mini photo studio With Black, white,Red and Green 4 colors background backdrops and Micro USB cable included (power bank NOT included), skid resistance with Hooks fixed. Non reflective, focusing your photography and Earning more professional and more beautiful pictures. PORTABLE LIGHT BOX KIT : With compact size and lightweight, the mini photo studio is easy to move around. No bigger than a piece of paper when it's folded!Folded size is 9.8" x 9" x 0.39". Space-saving and resist compression. EASY TO SET-UP: Assemble Your Own Photo Studio AnywhereIn minutes, you can unfold this LED lightbox studio and place it on any surface to get the perfect backdrop for Small articles Business Photography, Made of PP material with double side matte finish surface, Waterproof, very easy to clean. View More In Lighting & Studio. If you have any questions about this product by URiver, contact us by completing and submitting the form below. If you are looking for a specif part number, please include it with your message.